What I learned from my clients. Today’s post comes from a very personal realization about how I analyze any goal. Honestly, right now for me, I’m struggling largely with allowing myself to dream big. Being trained to work like an admin, I am constantly hashing out the details of everything I need to do; making the lists, checking them off and narrowing my vision hugely on the little things. I’ve recently noticed something about myself. When my client tells me a goal, or even a dream, I have somehow trained myself to go straight to this thinking process: “okay, well, that’s great, but it’s going to take a, b, and c and I just don’t know if we can get to b, but maybe if we do this”….etc. I completely miss the point! I completely fail to ingest the goal! What is a result of that? When the tasks to complete to get to that goal don’t turn out exactly how I wanted, I get flustered and sometimes those thoughts of ‘give up’ start flowing in my brain. In the end, I feel frustrated because maybe I haven’t even grasped what the goal means. I’m realizing now that it might be because I don’t spend enough time focusing on the end goal. I don’t focus on what I’m truly trying to accomplish, whether it’s personal or business. But, with my line of work, I’m realizing the artists I work with have the opposite train of thought – which is something I truly admire. My clients call me telling me of how a meeting, or performance, or a studio session has inspired them to write an album, start a new group, revamp their brand, etc.! And do you think they are thinking of the steps it takes to get there?? Hell no! Not right away at least! And you know what, it’s something I could learn to embrace myself. It’s all about growth when you are trying to accomplish anything. 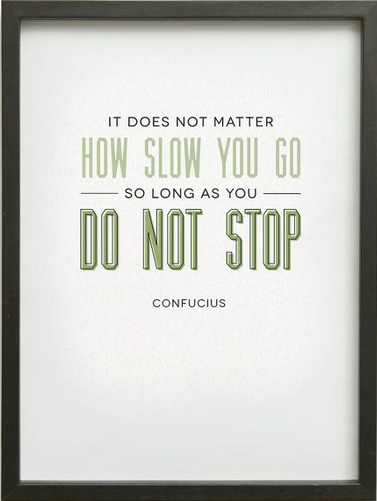 I love the quote, “It doesn’t matter how slow you go, as long as you don’t stop.” by Confucius. It is so true! So let’s say, you’re an artist you wants to master your instrument, which is a very strong goal in your mind. You can visualize yourself performing in Carnegie Hall or Madison Square Garden. However, committing to your craft is a struggle for you. You’re struggling with the steps to take you there. You are having difficulty practicing daily and committing to the instrument. I get it, I have been there. If this is truly your passion, you will wither find a way or find excuses. So, if you want to find a way to make your instrument a part of your daily practice, take small steps to make it happen.You know: DREAM BIG, but start small. If you try to run a marathon before you’ve run a mile, you are going to overwhelm your mind and body, right? So, yes, keep that focus on the visual in front of 100s of thousands, but commit to the daily small step to get you there. It’s not a waste of time when it contributes to your ultimate goal. As for me, I’m taking these big dreams one small step at a time. Even with small assignments thrown my way, I’m working to adjust my thinking to start with focusing on the large goal and what it will mean in the long run, THEN let’s get to a, b, and c, and maybe d. This way, when the day to day gets difficult and I don’t get things done how I envisioned, it doesn’t feel as disheartening – the BIG goal is still there to aspire and look to! I’m looking forward to taking this and running with it. I hope my struggle helps you break down yours and help you begin and stick to a daily commitment to make your dream happen. Next time you hear from me, I’ll be writing from the sunshine state! Hope you have a wonderful weekend and see you next time.